Edwardian terraced houses had front doors not greatly different from those of the late 19th century although colours differed. 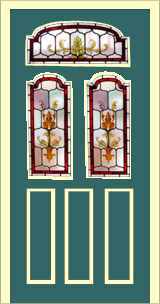 The door was painted in a variety of browns and greens, with the panels often in a lighter shade or the mouldings were in a contrasting colour. Glass was typically leaded and stained with designs showing Art Nouveau elements. 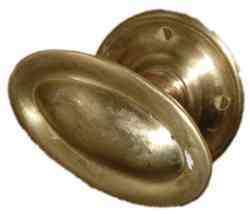 Door furniture was brass. 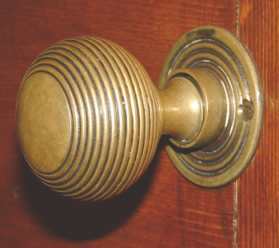 Houses with Tudor and Jacobean influences had a varnished door, glass was leaded but obscured more often than stained, and door furniture was in black iron. Internal doors reflected the styles of the front door. In the terraced house, finger plates had Art Nouveau designs. Increased use was made of glazed panels. Where panels were of wood they might be papered with a relief paper.